Float will be heading to Las Vegas, NV, for theDevLearn 2018 Conference, hosted by The eLearning Guild from October 24-26. We are excited to see many of our partners as well as meet many others within this wonderful community. Chad Udell, Float’s Managing Partner of Strategy and Product Development, will be presenting a Virtual and Augmented Reality-focused session titled: “Designing AR Experiences for Performance Support” on Thursday, October 25th at 3 p.m.
Udell will teach you practical approaches for advanced AR strategy, what markerless AR is and why it matters, how to approach measuring AR performance support, and how other businesses are solving big problems with AR solutions! This is a session you won’t want to miss! In addition, while at DevLearn, Float will be demoing some of the AR technologies they have been developing, and the unveiling of their LMS changes. 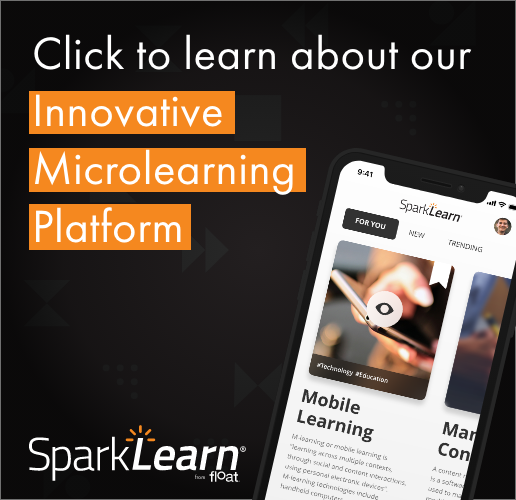 The key feature for the demoing portion will be the release of the new SparkLearn updates! With three new and major updates, SparkLearn is made more adaptable for its users.